This week at preschool co-op was loaded with creative space themed activities, as well as some fun letter review activities. 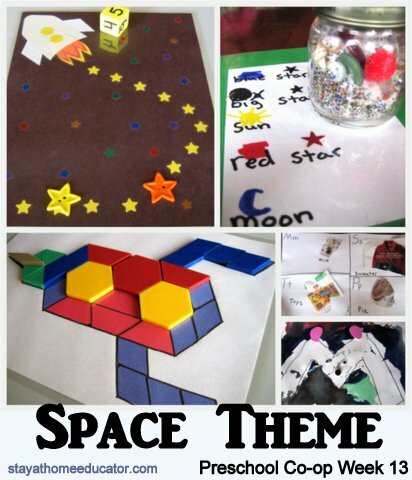 In addition, I did a few space activities at home with William, so this week’s post is loaded with great ideas that would make an excellent addition to any space themed preschool unit, but they are also perfect for some stand alone fun, too! Constellation Creations – I randomly placed some star stickers on a sheet of black construction paper. After a short discussion about stars and constellations, William drew an image connecting some of the stars, making his own constellation. He named it, and made up a short story about it. I don’t have a picture of it because the stickers were slightly transparent, so I couldn’t get a clear photo…sorry! Galaxy Play Dough – I made my favorite play dough recipe, colored it black with paste food coloring, and then added lots and lots of silver, blue, and purple glitter to it to make galaxy play dough. I sent it to preschool with William where the students used it for their writing mats. 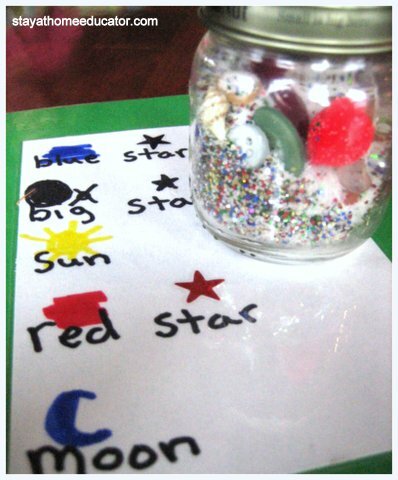 Eye Spy space Jar – The teaching mother made simple “eye spy” space themed jars for each of the students. The base is made up if salt and glitter, then she added small space themed objects and a list of things for students to find. This was one of William’s favorite activities. He still plays with his jar at home. 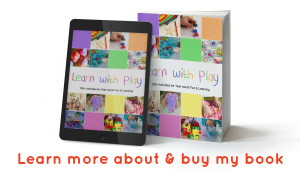 Phonemic Awareness: Review of all Skills – This week is review week, so students spent a little bit of time reviewing all the phonemic awareness skills previously taught. Phonics: Review – Students reviewed previously introduced letter names and sounds by doing picture sorts and initial sound matching. 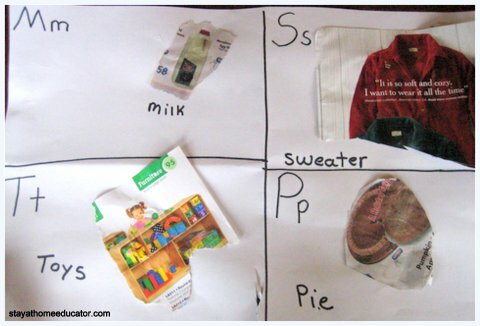 Initial Sound Matching – Students cut out pictures from newspaper and grocery ads and found pictures beginning with specific review letter sounds. 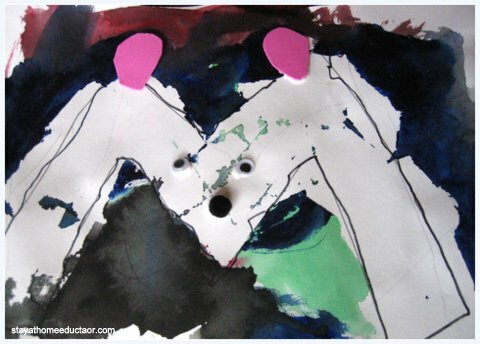 Letter M Mouse – Students used watercolors to paint a tape resist letter M. Once it dried, students practiced fine motor skills by peeling off the tape pieces. Then, they added ears, a nose and googly eyes to turn their letter M into a mouse. 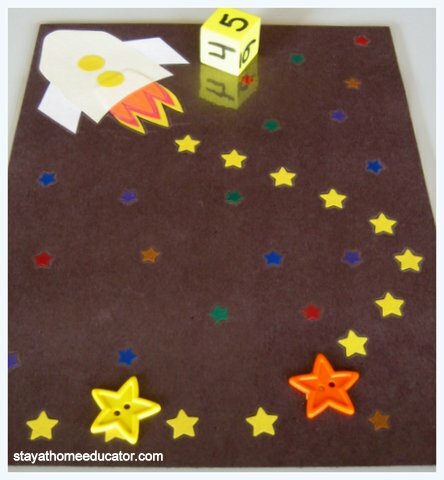 One to One Correspondence – The teaching mother prepared space themed counting mats. They had a giant planet on them and some cute alien stickers. On the planet were twelve dot stickers. Students rolled a dice and then counted “moon rocks” (pebbles painted glittery blue). 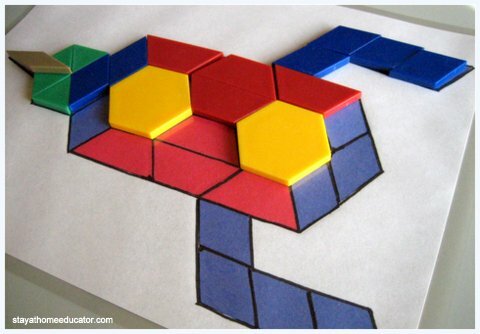 Addition and Subtraction – This is a game I made for William. I wanted to reintroduce some basic adding and subtracting concepts, so I made this game board. The goal is to be the first to move our star buttons to the rocket. We took turns rolling a dice. The first roll we counted the correct stars to move closer to the rocket. The second roll moved us away. The third moved us closer. The pattern continues until finally a star button reaches the rocket. Geometry – I have a set of pattern blocks with cards to follow, but I made my own spaceship to go along with the preschool’s space theme. This took me about 1/2 hour to put together, but was well worth the time. William was so excited to see I’d made a spaceship for him! Story Telling – William dictated a story about his constellation creation described under theme activities. I recorded word for word what he said, then read it back to him. Writing Practice Sheets – The teaching mother has all students practice writing their names as soon as they walk into preschool. They use tracing sheets. This is an easy way get in some extra writing practice while waiting for other classmates to get to preschool. We had a space theme obsession last year and read a lot of books back then. I highly recommend Postcards from Pluto, but it might be for somewhat older children. Thanks for sharing your space books with The Children’s Bookshelf! Loved this so much, I featured it this week on Mom’s Library Link-Up! 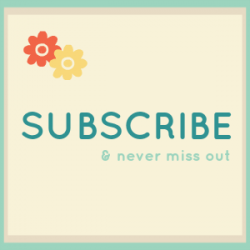 Head on over and grab a Featured on Hey Mommy, Chocolate Milk button to proudly add to your post/site! Can’t wait to see what you have been up to this week! What a fun space theme week!! Love the building with shapes! 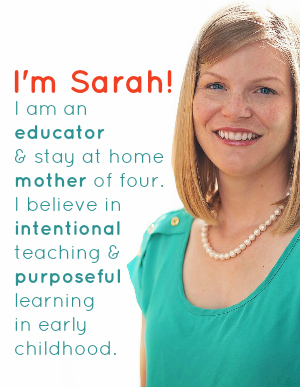 Your preschool co-op series has been fabulous, Sarah! I love that you have such a strong focus on phonics. I featured your posts and the space theme photo in my Starting a Montessori Playgroup or Montessori Homeschool Co-op post at http://livingmontessorinow.com/2013/07/29/montessori-monday-starting-a-montessori-playgroup-or-montessori-homeschool-coop/.